A SOFT WIND STIRS the gum trees along the banks of Carawine Gorge – a natural wonder on the Oakover River nestled within the borders of the 401,000-hectare Warrawagine Station in Western Australia’s northern Pilbara. Healthy looking Droughtmaster bulls are lying in their dustholes in the shade. Further along the bank Robin Mills and Rob Jowett are sitting on a grassy rise talking quietly, laughing occasionally and working their way through a packed lunch that’d probably be enough to happily fill the stomachs of at least four blokes. 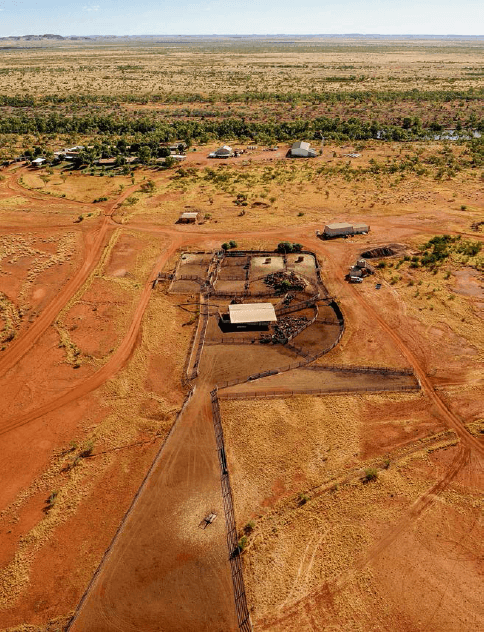 They are down this end of their property to have a look at the site of a new venture – centre pivot irrigation utilising the runoff water from the nearby Woodie Woodie manganese mine. They plan to plant sorghum, cut it and convert the biomass to methane, then to compressed natural gas. It’s another in a long list of improvements and innovations that have been wrought on Warrawagine over the past two decades. Back in 1992 Robin and his wife Lyle, Rob and two other investors chipped-in about $240,000 each to buy a pretty run down operation that had good bones and 460 head of rough cattle on it. Eight years later and the place was home to 25,000 head, had undergone substantial improvements and was valued at around $30 million. Another 14 years down the track and that process of improvement and innovation has continued apace, and paid off handsomely. Two of the original members left the partnership, but Robin, Lyle and Rob have stuck to their guns and carefully built Warrawagine up so that it is once more right up there among the best leases in Western Australia. “We’ve certainly learned a bit along the way, haven’t we Rob?” Robin says. “Oh yes, yes we have,” comes Rob’s quiet, thoughtful reply. While Robin and Lyle have been on the property since the beginning, Rob is based in Perth. He visits regularly, and has a dealership and service centre in Port Hedland 280 kilometres to the west, but has never lived on Warrawagine full-time. This is perhaps one of the keys to their success. While they talk often, Rob has the perspective that a bit of distance can bring. “His ability not to be looking at it all day long, but to have problems and solutions ticking over in the back of his mind and then to come back to us is with fresh ideas is a wonderful thing,” Robin says. Warrawagine was taken up as a cattle station in 1896 and managed by Frank Thompson and his wife Cecilia. It was during their tenure that the main homestead was built, in 1901, along with the store, wagon shed and blacksmith shop. In 1906 Mark Rubin bought the property, along with DeGrey and Mulyee stations. While still involved with cattle, by 1918 Warrawagine was home to 32,500 sheep. At the height of the wool era, 60,000 sheep were being shorn each year. The Rubin family rode the boom, but by 1975 the last sheep was trucked off the property, which was placed in receivership with Dalgety and put up for auction in 1976. “It was estimated that there was 6000 head of cattle on the place but no one was certain, so it was advertised as having 3000 head,” Robin says. “A bloke called Russell Timms had a small trucking business and he thought there was probably more cattle on there, so he put in a tender for $157,000 and it was accepted. He’d never run a cattle station, but he and his wife Peta took it over and away he went.” Timms took 8000 head off in the first year – 32,000 head in the first 10 years. He was also one of the first in the region to utilise aerial mustering. And, protracted disputes with the neighbours aside, he never looked back. That was until the government ordered him to destock the property as part of the Brucellosis and Tuberculosis Eradication Campaign (BTEC). “He told the government to get stuffed and put it on the market,” Robin says. “We were farming down south, but I’d always sort of wanted to come up here.” Robin had heard that Warrawagine might be for sale and expressed an interest, but then Timms decided not to sell, and to actually destock the place himself. “He reckoned he had about 10,000 head of cattle on it before they started to destock,” Robin says. “Well, he took 16,000 off it the first year, 5000 off in the second year and shot 5000 the next year.” Eventually, Timms decided to sell. Still, they took a punt and in June 1992 Robin and Lyle, both aged 52, moved to Warrawagine, and in many ways, moved 60 years back in time. “When we took over there was no fridge and no air-conditioner,” Robin says. “We only got the phone connected on December 10, 1992. Before that we had to drive over to the neighbours to make a phone call.” Power came from a generator that ran from 6am to 9pm. The fridge and freezer that they hooked up ran on kerosene and gas. During the day they’d charge a car battery to run a fan during the night to keep cool. But they had a clear vision about what they wanted to achieve, and were blessed by the weather, which rolled out eight of the best years the Pilbara had seen in the 20th century. In the first instance, the partners bought 2500 head of cattle from Holmes à Court properties in the Kimberley. 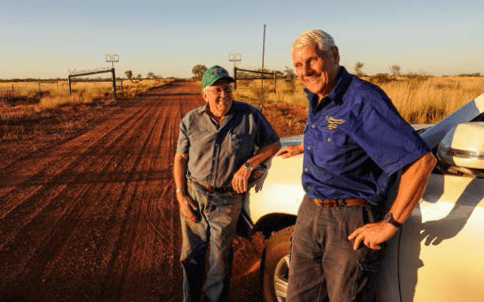 “Another bloke had 1900 head on agistment and we bargained to keep 20 percent of the female calves – we got 1300 calves out of that,” Robin says. With a view to expanding and improving their herd, the million-acre Bonney Downs to the south was bought. “We shifted 2000 Santa heifers back from there and sold another 2000 head – scrubbers and mickeys and bulls,” Robin says. “We only had Bonney Downs for 20 months before we sold it on again, but essentially the 2000 head we got off it cost us nothing.” It worked out that by then there were 1300 Kimberley cows, 1300 females from the agistment deal, 2000 from Bonney and the 460 left on Warrawagine when they bought the lease, plus their progeny. All the breeders were kept and the steers were culled out over the first eight years. By the year 2000, an estimated 20,000 head were on the place; a cull was in order. 25,000 head were eventually mustered, and 12,000 sold off – 8000 of which were old cows. “It gave us a real boost and cleared every bit of debt we had and we’ve just gone forwards from there,” Robin says. They had also instituted a program of buying in about 120 Droughtmaster bulls from Queensland each year. Those bloodlines are strong through the Warrawagine herd now. “Those first eight years were eight of the best the Pilbara had ever had – everything fell into place for us,” Robin says. Warrawagine averaged 600 millimetres of rain each year for eight years – the annual average for the 100 years before that was just 300mm. Evidence of this commitment to improvement is everywhere. The homestead is now nestled in acres of lawn, and is surrounded by nine other houses and separate air-conditioned rooms that can accommodate 17 staff, plus a swimming pool and dedicated kitchen and dining area. The main yards by the homestead were built in 2005 and are strong, well designed, well constructed, and can put through tens of thousands of head of cattle each year with efficiency. Warrawagine has roughly 500km of river frontage along the Oakover, Nullagine and De Grey Rivers, but there’s a lot of country away from the rivers that was being under-utilised. And so there are now 130 off-river watering points, 19 20,000-litre tanks, 43 windmills and 12 solar pumping systems, plus eleven 16- million-litre turkey-nest dams designed to catch the overflow from the rivers. Key watering points are monitored by computer from the homestead to ensure stock can always get water. Low stress stock handling is practised across the property, as is the grazing for profit philosophy of resting paddocks – which are covered by a variety of Roebourne Plains Grass, buffel grass and spinifex – and rotating stock to ensure pasture regeneration and sustainability. Robin and Lyle have four sons, Geoff, Chris, Scott and Brendon. All have lived on Warrawagine at one time or another. Scott and his wife Annette now manage the day-to-day running, with Robin and Lyle ostensibly moving into semi-retirement. Scott’s son Ben is head stockman and, like his father, a handy helicopter pilot. Ben’s Perth-based twin brother Alex set up all the computer systems on Warrawagine. His sister Kellie is about to finish her final year of a teaching degree in Perth, and his other sister Tahree is having a gap year on Warrawagine, having just completed school. Down at the main yards, Scott is running an expert eye over the cattle that were brought in the day before. The agents will be here the next day, and they have started drafting in preparation. “We started mustering last week,” Scott says. “We took six decks on triple road trains up to Broome. We’ve got boats coming in every two weeks now. Ramadan is in June/July so there’s a big push to get meat into Indonesia. We’re getting $150,000 for a six-deck road train, which is handy.” Scott says that they’ll aim to turn off 8000 head this year. The attraction of Wallal is essentially two-fold. Firstly, it’s a neat half-way staging point where cattle can be rested on the way to Broome. Secondly, and most significantly, it has an excellent water licence. There is the scope to tap eight gigalitres of clean water per annum via a 280m deep bore that pushes up 212L per second at 50psi, though the licence stands at 3.5GL right now. That 3.5GL has the capacity to run three centre pivots that will irrigate 40ha each and, when sown to sorghum, produce 300 tonnes per hectare of wet biomass. The first crop will go in around mid-June with the first cut coming off seven weeks later. “By growing our own hay, and plenty of it, the intention is to effectively drought-proof the entire operation,” Rob says. There are also plans afoot to develop a controlled breeding program utilising Wallal’s well-fenced and manageable paddocks to start producing their own herd bulls. As the evening’s coastal breeze flutters the Australian flag above the outdoor entertainment area on Wallal, staff tuck into a good spread of food prepared by Lynda. There is a lot of laughter and chiacking. Everyone has been working flat out, and everyone is tired, but there is a lot of energy, and the sense that there is a strong vision and sense of purpose guiding all their labours. Robin and Rob, sitting at the table, drinks in hand and smiles on their faces, appear more energised than anyone about what the future holds.